Take home a sentient alien parasite! Limited edition 10-inch tall red variant action figure. Extensive range of motion lets you pose Venom in wild, contorted ways. Gruesome details include a rotating tongue and poisonous-looking interchangeable parts! 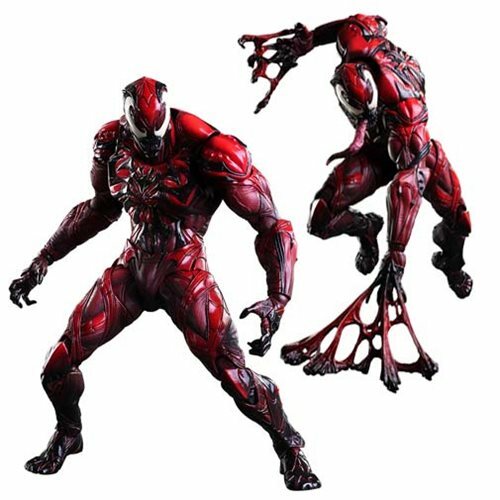 Carnage serves as the inspiration for this limited edition color version of The Marvel Universe Venom Red Variant Play Arts Kai Action Figure. Molded structures are used to add gruesome details like the rotating tongue, adding elements of rawness to his already lurid presence. This figure's range of motion is unlike any living creature on Earth, so it can be posed in wild, contorted ways. The bold black lines contrast intensely with the screaming red, and poisonous-looking interchangeable parts visualizing the symbiote's special skills round out this attention-grabbing presentation. Venom measures about 10-inches tall x 5-inches wide x 2-inches long and comes packaged in a window display box. Ages 15 and up. A sentient alien parasite otherwise known as a symbiote, Venom remains one of Spider-Man's most popular adversaries.